This is an original. A total of 101 Rose Morris 1997's went to the U.K. in 1964. This one actually went to Ireland. The Matchetts Music Store badge is affixed to the back of the neck. I love this guitar. U2? 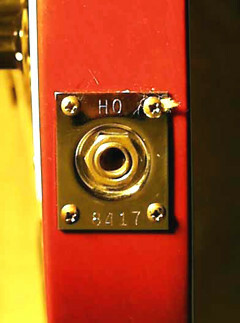 The great woodgrain and vintage color of the 1993 are apparent in this closeup of its f-hole. 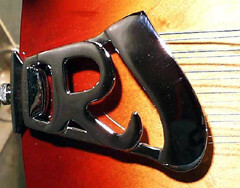 Both Guitars feature "R" tailpieces. All Rose-Morris 6-strings originally had an Accent Vibrato, and the 12-strings used trapeze tailpieces until 1965. The year is 1964. The Beatles hold the musical world in thrall. The Rickenbackers they play are a sensation. 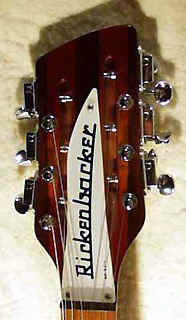 And all over Britian, groups and kids alike want Rickenbackers! 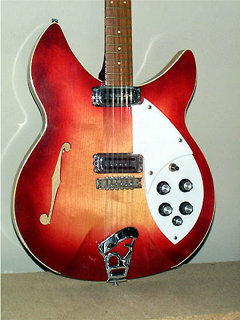 Even before the earth-shaking impact that the Beatles' rise caused at Rickenbacker, Rose-Morris Ltd. had been in contact with Rickenbacker about importing instruments to the U.K., and they had the inside track on all the companies clamoring for the distributorship rights in the wake of their sudden success. Rose-Morris must have been very happy indeed when it was decided that they would be the ones to distribute Ricks in the U.K.
Owing to what they felt were the slightly different tastes of Brits, the Rickenbackers that were sent there had unique features that set them apart from American Rickenbackers. 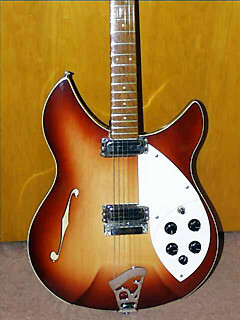 For one, none of the Rickenbackers shipped to the U.K. featured stereo outputs, or neck binding, or the trademark scimitar soundhole, opting for a more traditional f-hole. Additionally, the triangular inlays were not used. Body binding was only used on one model, the 1993, which was the counterpart of the 360/12. Actually, this guitar was more like a 330/12 with binding and f-hole, thanks to the absence of the other "deluxe" features. 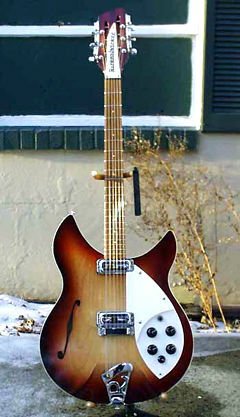 Over the years, these unusual guitars gained a cult following and were regarded as collectible and rare Rickenbackers. In 1987, there was a district manager at Sam Ash Music Stores who was an afficionado of Rickenbackers, and a fan of these particular models, known as "Jimmy D.". Of course, the model 1997 had been reissued, reproducing the most popular Rose-Morris model, but he wanted more. After contacting Shrilly Swanson at Rickenbacker, Sam Ash put in an order for some very special Vintage Reissues. At that time, Rickenbacker was building instruments to custom order on a limited basis, something they do not do anymore, sadly. They ordered reissues of the model 1993 12-string. And to boot, they ordered some six-string versions as well. 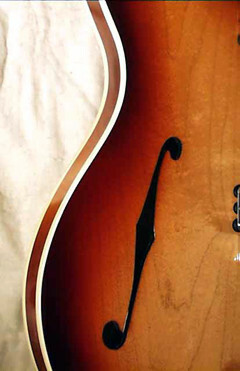 The difference between the reissue 1997 and the reissue model 1993 6-string are slight; the 1993 carries an R tailpiece, and the body is bound. The 12-string is essentially identical to the original 1993. The one difference, again, is the R tail in place of the trapeze used on most originals. 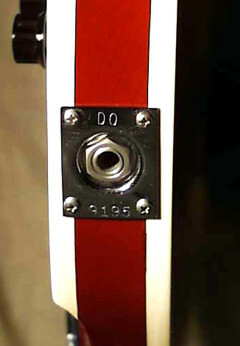 The headstock of the 1993/12. While hard to see here, the Schallers feature a hex head tuner ferrule that actually threads into the body of the tuner through the head. At one time, I had been told 12 of these instruments had been made; 6 12-strings and 6 six-strings. I was also told that 3 of each were fireglo, and 3 mapleglo. I have since been told that more than that were made, but I have been unable to find a solid production total. In any case, they are very rare. These are the only two examples I have encountered. The guitar at the top of this column is the 1993 six-string. It is owned by Craig Colandro of Union, New Jersey, and is a sumptous color, as is the 12-string, which is currently part of my collection. The finish of these guitars comes very close to approximating the more orangey fireglo of the '60s Rickenbackers, and they both are wonderful players. They do have a much flatter neck profile than any '60s Rickenbacker, as do all newer Ricks, and of course, hotter pickups, but both sound terrific. They were a rare and true pleasure to have in the same room together. I hope you have enjoyed a glance at these special and rare instruments. I would greatly welcome any further information about them, and would love to hear from someone who has owned or seen one. All pictures by the author except for *. Thanks to Craig Colandro for the use of his super guitar. All pictures taken with the Olympus D-500L Digital Camera. The reissue. Like all 300 series reissues, a side by side comparison shows the back pickup to be closer to the bridge. This one is a 3 pickup model 1997SPC from 1994. The 615 counterpart was Model 1995. The 325 counterpart was Model 1996. The 335 counterpart was Model 1997. The 345 counterpart was Model 1998. The 4001 counterpart was Model 1999. And the 12-string counterpart, a mix of 330 and 360 features, was Model 1993. 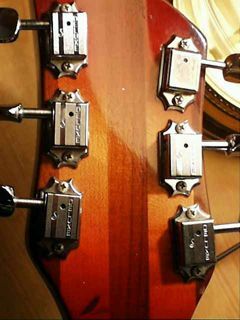 1993 six-string tuners. "G" tuner has been replaced. 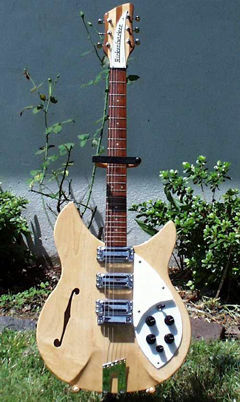 These guitars used the first generation of reissue Rickenbacker tuners, made by Schaller, and featuring a small snake logo with the word "Deluxe". 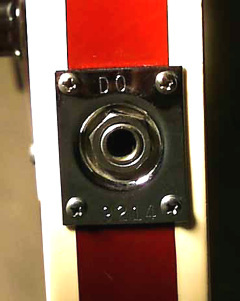 Meant to approximate the Klusons used on the originals, they had a different shaft design, using a threaded collar to hold the tuner to the headstock through the peghole. They were replaced with the more accurate Gotoh-made RIC Deluxe tuners in 1989, at the outset of the John Lennon Signature Series. Somewhere on its journey, the six-string 1993 has had its "G" tuner replaced with one of the Gotohs. * Model 1993 Rose, Morris export - this one went to Sweden! * Apparently a few of the export model 1993 stayed in the USA and were called 330S/12. About the only difference is the knobs.